And it's not even done yet. They say bad luck happens in three's. If so, I'm done. Good thing I had such a relaxing vacation, otherwise I'd have gone loopy by now. :-) First of course there was my husbands office with all of the water damage. Then our car broke down. Turns out it was the fuel pump. $750 later our car is at least back on the road. Dwyn and Marg are off to the Bancroft Gemboree today. Once I year, Bancroft hosts Canada's largest gem and mineral show. It's a great place to pick up unusual cabs, and semi precious stones. maybe they'll post pics tomorrow of some of their goodies! After a BeadFX roadtrip to Buffalo earlier this summer, we have been plagued with talk of wild turkeys. Our first sighting was in a park, just opposite the Albright-Knox Art Gallery. We promptly stopped the car to get a better look and as Cindy, Sue, Nadine and I sat there in the middle of the road staring at this gigantic bird staring back at us, we decided it must be a wild turkey. A google search the following day proved our suspicions right, this was no emu escaped from the zoo, it was a four foot tall turkey! Then, a few weeks later, talk of a wild turkey/school bus collision in Southern Ontario appeared in the news. Next, there was an article in a local newspaper reporting a wild turkey sighting near Bluffer's Park. 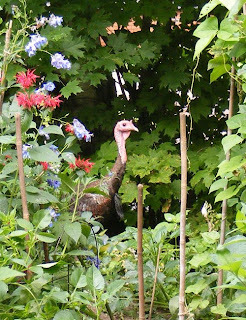 Then, to my surprise, as a hawk flew by my kitchen window last Tuesday, a turkey appeared in the yard. By the time I grabbed my camera and made it outside, the turkey had disappeared. But then, from behind a patch of bergamot, a head popped out of the foliage. 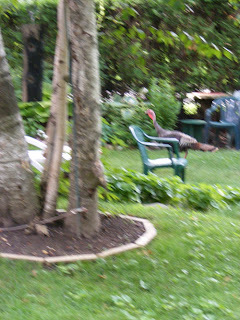 The turkey then high-tailed it for the neighbour's yard (Man, those turkeys can run!) and was last heard clucking in the distance. We're not sure what this turkey was doing roaming the suburbs of Toronto, but it definitely seemed like a fantasy! And if you're not too busy birding on Thursday August 21st, why not drop by BeadFX for Cindy Vroom's Fringe Fantasy class. In this class you will learn a deceptively simple technique of fringing which creates your own wearable coral reef. 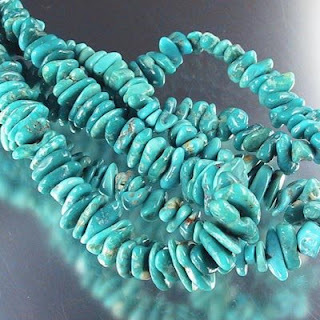 Starting with a peyote band, you will learn to fringe both sides, or wrap around the band for a more dimensional look. You may even catch a glimpse of the peregrine falcon Sue spotted in the neighbourhood late last week! I'm back from vacation, and traveling with children. Traveling with young children...that should be enough to make anyone shudder in sheer horror. Did you know that a 3 year old child has the ability to turn around a 737? Much to my embarrassment and horror, 2 parents, 1 grandmother, and 3 flight attendants are apparently not enough to strap a 3 year old into a seatbelt if she doesn't want to go in one. So, they turned around the plane, and headed back to the gate. Presumably to kick us off the plane. Just before we got back, the adrenaline required to fight off six adults must of wore off. She passed out cold, we buckled her in and off we go. I didn't dare look at anyone else on the plane. Yeesh. 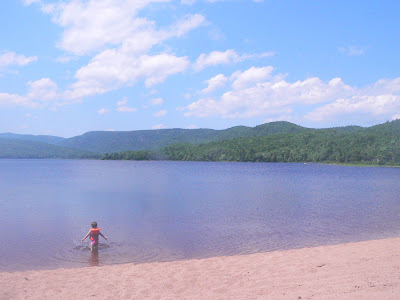 Cape Breton island was awesome! 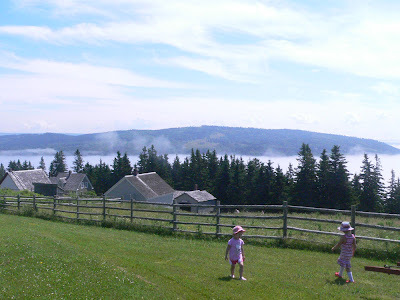 We headed up the cabot trail to a cottage in Ingonish, which is a little village situated in the Cape Breton Highlands National Park. 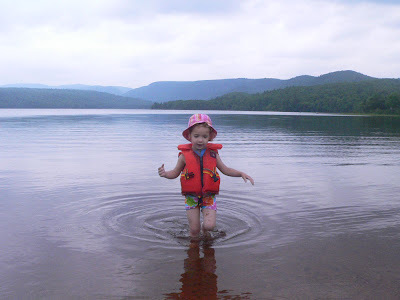 We found a little deserted lake in the park, surrounded by mountains. There was rarely anyone else there, so it was like having our very own private lake. The kids really enjoyed collecting rocks and shells along the ocean beaches, and we gorged ourselves on fresh scallops. Sometimes, you can find beads in the most unlikely places. One rainy day, while driving around the cabot trail, we discovered a neat glass shop. The owner was lovely, and she carried tons of stained, fused, and blown glass. She also had a surprisingly large selection of lampwork beads. 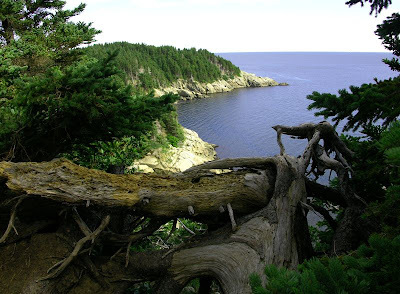 If you're ever up in Wreck Cove, be sure to check it out! The trip home was a breeze, armed with a bag of bribes for Isla, she was a dream child :-) All in all, it was one of the best vacations I've ever taken! Of course, something always has to go very wrong. Upon checking my home phone messages, we discovered a message from the landlord of our other office. The other office space is used primarily by my husband for software development. It turns out, there was a fire, or overheating in the ceiling which caused the sprinkler system to go off. The water damage is very extensive. 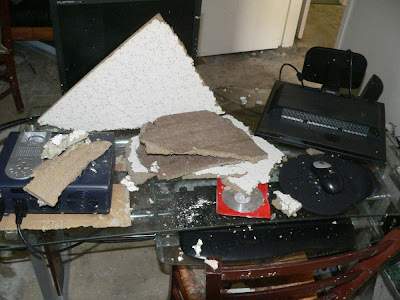 Almost everything in the office was completely destroyed. We now have the fun job of spending hours on the phone with the insurance companies, and replacing all of my husbands office stuff. Sigh. You have to remember what you didn't know when you started - you have to keep that sense of wonder, remember the mystery and magic of it all, and not let is slip away. Case in point. I had some friends from my "other life" visit me - from my "dog" world - (ever find you have more than one circle of friends with almost no overlap? Maybe work and family? For me, it's beads and dogs.) They wanted to see where I make stuff - so I gave them the grand tour. They were fascinated - even with simple stuff. Single beads that I would relegate to the scrap heap - they were admiring and playing with. It reminded me that if you are new to this - even a simple bead or a nicely done, single strand necklace can be a wonder - an unimaginable mystery, a joy, a bijou - a precious little trinket! Never lose the wonder! Try and remember what you didn't know once upon a time (or last Tuesday) and hold those memories somewhere - pull them out every once in a while and look at them! Remember the Magic! Ever wander by a building with a huge, colourful graphic word carefully painted on it, and wonder what the heck it says? Graffiti "fonts" are meaningful - but obfuscation appears to be the name of the game. Try out this Graffiti Creator and see how, with stretching and pulling, overlapping, and the addition of "Yolk," "Limbs," "Stripes" and "Waves" - what started as a more or less readable word becomes camouflaged into pure design. New Beadwork and Stringing kits from Marilyn Gardiner - easy projects that come with everything you need! New Vintage - no wait - that doesn't sound right. Old beads. Hmmm. Not much better. New to us and you, but actually old beads. Wordy. Vintage Swarovski and Chechoslovakian (yes, then it was Chechoslovakia!) beads and Rose Montees! 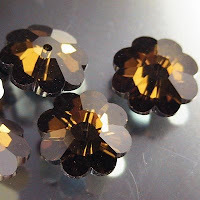 Including some Swarovski colours long since discontinued: Mink and Seal. Apparently, they were going through a fur-bearing mammal stage in naming. Sometimes, when I make a piece of jewellery, or even just a bead, a name comes to me out of the blue. Sometimes, it comes afterward, when I hold it in my hand. Sometimes, it is a simple description, or based on circumstances. For instance, this dichroic glass beauty is called "Woot" - which is short for, depending on your source, "Wow-loot" or "Want One Of Those." Both meanings are good, in my opinion - they are come from gaming slang. The Pink Dragon is known as "Heartburn" - not for his colour, but because I had a vicious attack of heartburn while making him - as you may know, lampworking is not an activity you can stop - the glass shatters if you let it cool down and then heat it up rapidly - so there was no choice but to soldier on. Now, I keep antacid tablets by the kiln! Earrings of Hypnotize Fish? Hmmm - that has possibilities . . . . Bracelet of Summon Carvers - can I get that as a Bracelet of Summon Construction Workers? With all the rain we've had these last two months, the garden is growing with a ferocity that I've never seen before - the Hollyhocks are easily 7 and 8 feet tall - I have an Echinacea that snarls at me when I go by, and the 4 foot tall statue of a heron that I bought in the spring has completely disappeared in the overgrowth! In my case, it's only going to get more extreme. I was mixing some fertilizer up - the kind you dilute in water - for the new cedar hedge we planted this year. It's been growing really well - but I wanted to get one more feeding in before the rest of the summer. My method is to fill a large tub with water, mix in the fertilizer, and scoop out bucketfuls for each tree (30 of them!). I was measuring out the fertilizer into the full tub of water when an incident required my immediate attention and action. This is what we call a "dog story" in my house. I charge off, fix the problem at hand, and when I return - where's the fertilizer? Yes - I had dropped it - straight into the tub of water, mixing up about a year's supply. So I did a lot of fertilizing, things I did not intend to fertilize, including a big patch of the lawn where I finally dumped the remainder of the tub out. I guess I'd better go sharpen up the lawn mower! BTW - isn't the Hollyhock a wonderful colour? I'd love to reproduce that shading of colour on a bead!!! I can’t quite explain it, but every summer, the hotter it gets the more people want to lampwork! Maybe, it’s because they can’t wait to make fun and summery beads. Maybe, they use it as reverse air-conditioning (because after sitting at a torch and reaching into a 950°F kiln for a few hours, even the summer heat feels cool!). Or, maybe it stems from a deep-seated desire to roast marshmallows on a campfire! Whatever the reason, why not join in on all the fun! Drop by our studio and check out the glass, mandrels, torches and kilns used to create beautiful handmade glass beads. And while you’re at it, why not sign up for a class! Coming in August, Dwyn Tomlinson (aka DragonJools) will be teaching her famous 4-Hour Introduction to Lampwork class and 10-Hour Learn to Make Glass Beads Weekend. Students flock to Dwyn's classes - coming from great distances (Brazil, Spain) or just down the street. Her enthusiasm and passion for glass spills over onto the students and gives them permission to delight in the wonder of this new found obsession. Her sense of humor, patience and background in technical writing and adult education serve her well in teaching beginners. The 4-hour Introduction to Lampworking is an excellent class for "getting your feet wet." If you are curious about working with glass, making beads or just want to try something different - then this is a good introduction. Of course, in four hours, it's impossible to cover everything - but you will get a sense of just how addictive this pastime can be! During the class you will touch on a wide range of techniques, discuss safety, setting up a home studio, sources, and re-sources. The class is all hands-on, with a Minor™ torch for each student. Students usually make 6-12 beads during the class and will practice creating basic round beads, shaped beads and dotted and bumpy beads. If time permits, you may also get to work with frit or silver foil or try your hand at a floral design. The Learn to Make Glass Beads Weekend is a 10-hour weekend class designed to introduce you to making glass beads by hand! More in-depth than the 4-hour intro - this class is excellent for those who are complete beginners or who have taken a short introduction. Techniques are covered in more detail, and there is more practice time. You will also get to pull stringers and twisties or attempt a hollow bead as time permits. 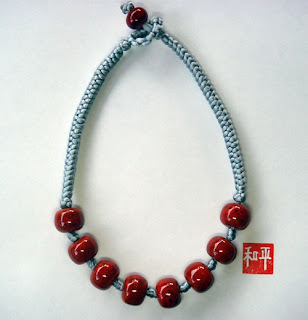 The beads you make in these classes will be kiln-annealed and will be available for pick-up the following day. If you are from out of town, we are happy to mail them to you at no extra charge. Please wear cotton fabric or other non-flammable clothing; long, tight-fitting sleeves and closable collars; old jeans, and if you have long hair, please tie it back. Safety glasses are provided. It's now just Tuesday morning and I'm already a day behind and deeply confused as to which day of the week it is. It feels like Wednesday already. Ack! Yesterday started out with my sitting down to do the weekly photography shoot for the store. About 3 pictures into it, the camera reported a "card error." Well - given that I shoot hundreds of pics a week, pull that card in and out of the camera over and over, and have been using it for years, that really wasn't a huge surprise. I popped it into the card reader on the computer, and, indeed, it wasn't reading. So - off to ... Staples, I guess, as I have other office-y things to get. I head out the door, it's now mid-morning. I spend a lot of time at office supply place, and don't actually find everything I want, of course. But at least they seem to have dropped that deeply annoying policy of asking everyone if they found what they were looking for. This annoys me because the cashiers have obviously been told that if they don't ask, they are in trouble, because there is no indication that they: a) care, b) make a note of it, c) will help you find it, or d) realize that if you didn't find any of what you were looking for at all, you wouldn't be at the check-out desk in the first place. Argh! Anyway - $350 later (I got distracted by a bunch of other stuff) - I'm home and it's now early afternoon. I carve the new memory card out of the blister packaging - and there's another thing that annoys the heck out of me - packaging that you can't get into. I'd like to take the executives from some of these companies and put them in a room and videotape them trying to open the packages without damaging the product. I put the card in the camera - take a few shots, and then transfer it to the computer to make sure that all is working well, before shooting a couple of hundred pictures. It is working fine. On a whim, I try the old card again, and LO! It works. Double Argh. Now I'm three quarters of a day behind, I need to leave for an appointment, and I just spent a whack of cash that could have waited. Great start to the week. Let's hope it gets better. I seriously need a time machine. Where's the Doctor when you need him? What inspires me? Consider that I design some of our InspirationFX to inspire you, what actually inspires me? I start with a focal piece, and generally - I am inspired by the colour of it. Sometimes I go looking for the beads to work with the focal bead - sometimes they reach out and bite me. This tawny tablet bead was just hanging out on my desk, when I happened to be pulling out pearls for another project. I just put down these brown pearls next to it, and Wow! I was struck by how perfectly they went together. 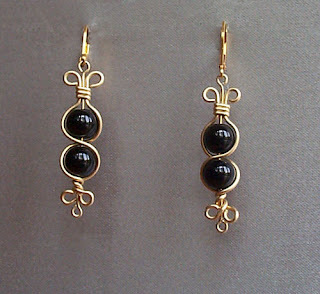 Gold spacers seemed natural - silver would have been too harsh for the warm colours of the pearls and bead. I needed spacers - the pearls weren't long enough for a necklace at a length I wanted without them. In this case - I went looking for beads to go with it - pearls and crystals. I was thinking pearls because there are some lovely metallically, coloured pearls in the store right now. After the success of the necklace above, pearls are on my mind. I have no idea how I'm going to hang it with that honking big hole. Marg suggested Kumihumo, or a silver lining. Both are good ideas, but unlikely to happen soon - so I'm thinking multiple strands. I want a contrasting colour to go with all that sage and teal - I was thinking copper, but the gold pearls seem to pick up gold highlights on the bead, so I may go with that instead. In this case - I made the focal bead in memory of a beautiful stone donut that I had that was Ametrine. I had strung it, and really liked the necklace, but the stone was flawed, and it broke and fell off the necklace and I lost it. For years, I've tried to purchase another, but, no luck. So, I finally made my own. Rather than adding it back to the original necklace, I've chosen amber and amethyst to go with it. Again - gold findings to go with the warm colours. Probably multiple strands - and some seedbeads as filler, and to loop through the focal bead. Can I really call it a bead at this size? What inspires you? Your outfits? Events to go to? Memories? All of these? Something else? Just what the heck is all this talk about Fine Silver and Sterling Silver? Just what is the difference, and why do you care? 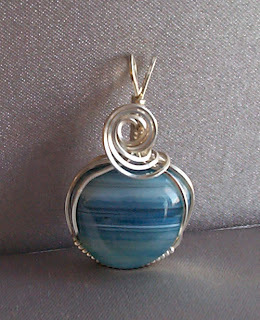 You may have read some recent bead magazines with articles about fusing fine silver wire into jumprings and more. You have probably heard of Sterling Silver - used in jewellery. You have quite probably, by now, heard of Metal Clay - either Precious Metal Clay (PMC) or Art Clay Silver (ACS) - both of which are brand names. But just what is the difference between these silvers? To put it simply, Fine Silver is Pure Silver. Sterling Silver is an alloy. Fine silver can be tested to be 99.9% pure silver metal - that missing .1 percent is because it is just not technically possible to remove all the impurities. Sterling Silver is an alloy - which is a mixture of metals. Sterling silver jewellery is often stamped (hallmarked) with 925. Sterling is 92.5% silver, and the rest is other metals - mostly copper. The addition of copper to silver makes it stronger, but has some drawbacks, such as tarnishing, and a phenomenon known as "firescale" when you heat sterling silver. Sterling silver will also get brittle if is it bent and manipulated - this is called "work hardening" and fine silver does not do this. This work hardening process can be reversed by heating and cooling in a process called "annealing." For these reasons, sterling silver is generally preferred for jewellery making for it's additional strength, but for applications where strength is not paramount, then fine silver might be preferred. So, which to use and when? 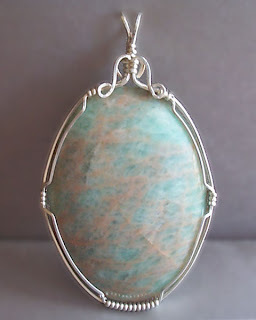 Because fine silver doesn't work harden, wire crochet projects using thin, fine silver do not need the reheating of the annealing process - and because they use a lot of wire, strength is not usually an issue, so fine silver shines here. Metal clays, PMC and ACS, are fine silver, and so fine silver wire works well when embedded in the clay for loops and bails, etc. Fine silver can be used with glass in lampworking (bead making) to add interest to the bead by making interesting chemical reactions with the glass - making cream-coloured glass look stoney or black look blue. The reaction with the copper in sterling is not so attractive, and so fine silver is used. Fine silver is used for metal fusing, as it has a lower melting point, and does not firescale. Firescale is a dull grey layer that forms on, and into, the surface of sterling silver and must be polished off. Generally, much of the process of soldering sterling silver, the fluxing and the pickling, is to control firescale, and so is eliminated when working with fine silver. With the passage of time, sterling silver will tarnish, and so is best stored in an enclosed space with an anti-tarnish strip. Sterling silver is easily cleaned - wiping with a special silver cleaning cloth will take it off if it has not been left long - but the process gets tedious after a while. Fine silver will also tarnish, but rather than black, takes on a mild, goldish patina - and in my experience, the tarnish takes longer to happen. With all these advantages - you'd think that Fine silver would reign supreme, but the superiour strength and durability of Sterling silver does make it the metal of choice in most applications. 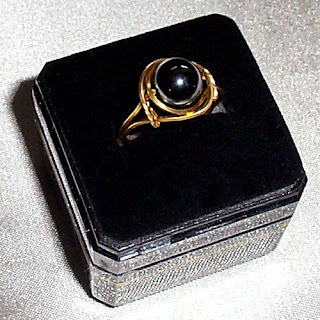 It is used when strength and durability is paramount, rings, bracelets, chains, and all manner of jewellery. Sterling silver has been in use a long time, and is very traditional now, so you are likely to see more sterling silver. There are some exciting new alloys being developed and used now - such as a non-tarnish silver alloy that adds a touch of Germanium to the alloy. There is a great deal of tradition in the world of jewellery making - and on the part of the consumer - so it may take a while to see significant changes - but for those making or buying art jewellery (as opposed to mass-produced) - there are some exciting options! Sometimes, if Catherine, aka Sailorgirl, and I are teaching on the same night, (she teaches a business classes for jewelry makers, and I teach the bead making classes), we'll go for a few drinks after. As we are both flameworkers, there's always something beady to discuss, but we usually ramble off onto other topics as well. For instance, she and her significant other spend the brutal Canadian winter cruising around the Caribbean on their boat. Sailors always have stories and she has some great ones. Not all her stories are about sailing, she has some great stories about doing shows and selling, and most of what I know about marketing, I learned from her. You can go to her blog and read some of her stories - in particular - check out her story about why you should always wear a fabulous bracelet on your left wrist when going through a drive-thru . . . .
New next week - more Japanese Bugles. When we discontinued the Czech Bugles - we promised more of the Japanese Bugles to take their place. Here's more of them, coming at ya. These are size 3's - 9 mm. Cynthia, Jen's sister in-law, and our very competent show organizer, dropped by the store the other night, after hours, and she had her two young sons with her. She popped into the back office to check on some stuff, and told the two boys they could pick out some beads for a necklace to make. She proceeded to make some calls, handle some paperwork, while the constant pitter-rattle of dropping beads sounded from the showroom part of the store. Finally, finished, she headed back out to gather her sons. Her scream could be heard down the block. The two boys had picked out enough beads for necklaces that would make my stuff look minimalist by comparison. High-end stuff too - whole containers of Swarovski stars, bicones, cubes, resin beads, leaves, pressed glass, turtles, Preciosa, CZs - all mixed up together! 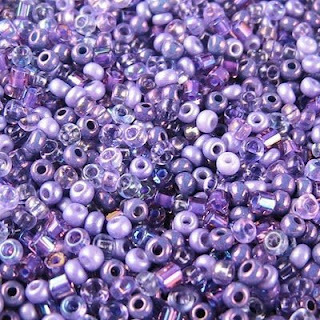 A small fortune in beads! It took a significant amount of time to sort it out and put everything back! If the boys want to design like that - they are going to have to get jobs! Occasionally, someone will email us to ask about the lead content in one bead or another. This is Erin's carefully researched reply. Unfortunately many basemetal items can contain lead. We do not carry any products that we know to contain hazardous amounts of lead. "TierraCast uses an alloy called Britannia, composed of 92% Tin, 7½% Antimony and ½% Copper. Tin is refined from ore that contains other metals, including lead. A chemical process is used to remove the lead, but trace amounts still remain. Our casting alloy is routinely tested for lead content, yielding results ranging from 179 to 300 parts per million (PPM). This is well below the Food and Drug Administration's (FDA) standard of 500 PPM deemed safe for pewter used for culinary purposes in contact with food. Although all pewter contains trace amounts of lead, the term "lead free pewter" is sometimes used to describe pewter that meets the stringent FDA standard." Many of the basemetal findings we carry, with fully numeric product numbers, are plated over brass and are lead free. 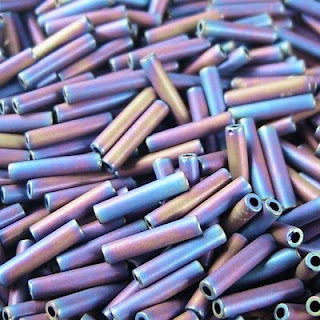 Unfortunately we do not know the exact metal compositions for a number of the basemetal beads and findings we carry. If there are specific items you are interested in, please let us know their product numbers. We can then contact our supplier, who can in turn contact the manufacturer regarding metal content. Swarovski and Preciosa crystals also contain lead to give the glass added sparkle. We have read that Swarovski crystal contains approximately 32% lead. However, it is difficult for lead to leach out of crystal without prolonged exposure to liquids or acids. As such, California's lead in jewelry law has deemed leaded crystal a Class 1 material with no restriction limit for use in adult jewelry. However, they have restricted the use of leaded crystal in children's jewelry to 1 gram. 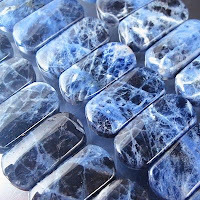 Marg just brought to my attention that while I got it right in the description - I refer to these as Lapis - Free From Ovals on the front page of the site. She asked me what they are free from? Well - they are free from fat, free from cholesterol, free from sugar, free from artificial sweeteners. Free from the artificial conventions imposed by an uncaring society. Free from the arbitrary pigeon-holing that wants them to be true ovals. Free from the restrictive thinking that controlled their parents' lives. Free to be the shape they were born to be. They are free, man - know what ah'm sayin'? We've seen some cool designs made with metal mesh tubing - our buyer spotted this nylon mesh tubing and scooped some. This is a little piece she whipped up using it and one of my beads! Very handsome, I think. OK, it's official - we're going to stop calling it semi-precious and just refer to them as stone beads. And I've done some serious re-organizing here - some of the pages won't have a lot on them, especially if we are out of stock - but it should be waaaay easier to find things. I hope. Watch for the changes tonight at midnight. Yes - that means that I am actually up at midnight, working on the site. At least I'm working from home! The sun is shining, the humidity is building and a chorus of cicadas floats through the air. The dog days of summer are finally here! And what could be better than taking your beading outside! Sure the breeze kicks up every-so-often and blows your beading mat and all of your beads across lawn - but it's warm and it's sunny and we certainly need the vitamin D.
But if you're looking for a break from all that heat and humidity, drop by our air conditioned store this Sunday July 20th for Cindy Vroom's Textural Herringbone class. Create a light and frothy cuff, meshing together 6/0's and 11/0's, with this variation of herringbone stitch. 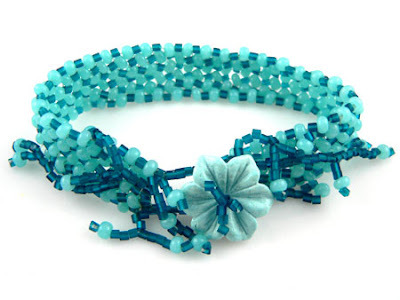 Embellish with matching branches of seed beads and a floral clasp for an elegant summer bracelet. The dates for next year's Metal Clay Conference have been announced. If you are passionate about Metal Clay - you might want to put this on your calendar. July 16 - 18, 2009, in Illinois, and hosted by Art Clay World USA. The keynote speaker will be Alan Revere, founder of the Revere Academy of Jewelry Design, in California and well-known author and goldsmith. BTW - the website promoting this has got to be one of the dullest sites I've ever seen. Boo-hiss for boring design. At least it works and has the info on it, but what did they do - grab the most boring template out of the box? Oh well, it's the content that counts, right? The sizing of wire gauges is anti-intuitive - much like the sizes of beads. A bigger number means a smaller, thinner wire. Wire is made by starting with a fairly fat rod of metal, and drawing it through a hole that is just slightly smaller than the rod itself. The end is tapered to get it into the hole, and then the wire is "drawn" or pulled through the hole, which stretches the wire out and makes it thinner, and longer. Each time the wire is "drawn" - a smaller hole is used, and the wire gets progressively thinner and longer with each pass. This is how a short fat rod of metal can be transformed into a long skinny piece of wire. The process may be complicated by the metal becoming brittle as it is manipulated and stretched, so that it needs to be softened by heating and cooling (annealed) during the process. And so, the number of times a wire was "drawn" - processed - related to the number that indicated it's size. Hence, a wire that had been drawn many times had a higher number, and a smaller size. 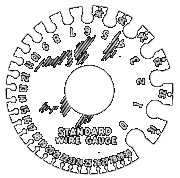 Here is a conversion chart for relating wire gauge numbers to millimetres (mm). Remember, sometimes there isn't a perfect match. Hauser & Miller have an excellent chart for converting precious metal wire weights to lengths, which can be useful - if you have directions for a project that say "take 1 ounce of sterling 18 gauge wire . . . " and all you know is how long your wire is. But - what does it all mean? What gauge, or size, do you use and when? Here are some rules of thumb. Remember that Fine Silver Wire and the Artistic (brand) Wire (which has a copper core) are softer (easier to bend) than Sterling Silver Wire. 14 gauge wire is a honking thick piece of wire. 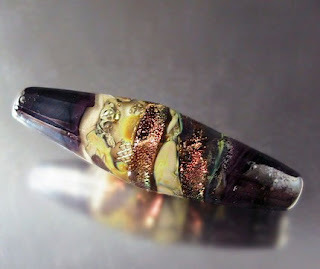 It can be excellent for making custom head pins for large lampwork focal beads. It is hard to bend - you will need good tools, and easy to mark while bending. 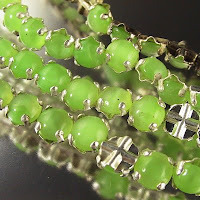 The longer the piece is, the easier you will find it is to bend, so if you can slide your bead onto a long piece to do, say, a wrapped loop, and then cut it, it will be much easier. 18 gauge wire is quite strong, but still bendable. It requires tools for precision bends. You could use it as a base for a bangle bracelet. 20 and 22 gauge are nice, useful, middle of the road sizes. You can wire up beads, it is strong enough to hold it's shape, good useful size to have on hand at all times. 24 and 26 are more like the supporting players - great for wiring if you don't need a lot of strength and don't want a lot of weight. Good for earrings. 28 and 30 are very fine - use these for intricate projects that don't need a lot of strength - wiring beads onto a screen finding, for instance. If you haven't checked out Wet Canvas yet - you should. Wet Canvas is an online forum and community for artists of all ilks. From painting to pastel to glass to fibre - and many more - whatever your media - there is a lively community of folks there ready to discuss and share. From inspirations to techniques, problem solving, marketing, copyright, - any issue you care to think of - you'll find a discussion. It's free to join, but even if you want to just lurk and read the posts without signing up - you can do that. I've been reading it for years and never made a post! The glass forums are lively and informative and there are tutorials there too - but reading some of the other forums is fun too. Cool little insights into other peoples worlds, like illustrators and professional artists. There doesn't seem to be a section for seedbead artists however - maybe if enough people asked . . . . Many other cool stone beads (hence my desire to reorganize the stone bead section!). Also, some new of the lovely sterling clasps from Nina Designs. Jen is taking a vacation! What noive that gal has! Really! And she speaks Gaelic! I just thought she was swearing under her breath! . . . . Maybe she is! Omigawd - the Stone of the Month just FLEW out the door - we'll reorder what we can - and we'll double our order for next month. I didn't even get any of that fabulous Purple Crazy Lace. I'm going to do a little re-organizing of the stone beads section - split the stones up a bit more. Now that we have pictures to make it a little clearer what is on a page, I'm not quite so afraid to have smaller pages. Some of the more popular stones, i.e. turquoise, I think deserve their own page, but here's my question to you - what do I do with variations in different colours? Do I put those on the same page? For instance - Yellow Turquoise and Purple Turquoise - do they go on a page with the regular turquoise? How about Amethyst? Does that get a page by itself? To me, it is closely related to Quartz, and I often use them together, so that's where I tend to want to put it - but does that make sense to anyone else? 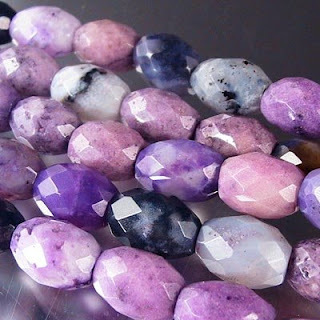 Do Purple Turquoise and Amethyst belong on the same page? To my mind - not, but that's me. I don't want to break it down so there are 3 items on a page and 20 pages - that seems lame to me - but does that work for you? Let me know - feel free to post a comment after this post - comments can be anonymous. 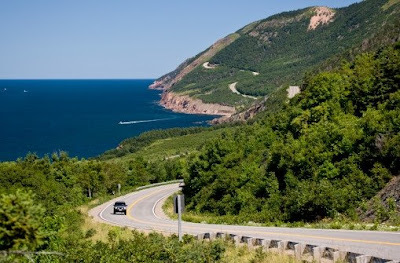 Cape Breton Here I Come! Guess who's coming back to BeadFX? Angela Peace! After teaching two packed Chinese Knotting classes last May, Angela will be back in August to teach her introductory class and a new intermediate class! 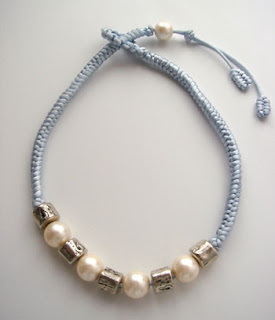 This introductory course will introduce you to the traditional art of Chinese knotting. You will learn how to tie basic knots, such as the button knot and snake knot, and learn how to create an adjustable button knot cord fastener. We will also discuss how to incorporate these techniques into your jewellery when stringing or making pendant style necklaces. 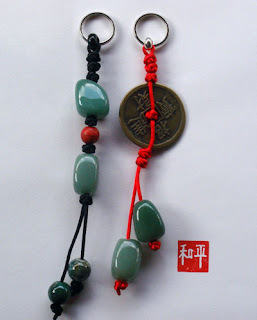 During the class you will complete an Asian style key ring. This intermediate course will give you the skills to go beyond the button knot. Learn how to make a knotted loop closure, add a metal clasp, change the number of working cords and finish cord ends. By the end of the course you will have learned the techniques required to design and make a classic style necklace. 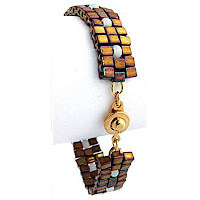 During the class you will complete a classic style bracelet using all of the skills needed for larger necklace projects. As a prerequisite for this course you must be able to tie single and double button knots. Here's an interesting little program for those of you into embroidery and beads - a program to convert colour references from floss to other brands of floss, or to beads, or the other way. If you have a bead pattern, and want to try embroidering it, or an embroidery pattern, and want to try beading it - this will help you get your colours sorted out. They have a cross stitch pattern converter too. I don't pretend to understand it - but as our current survey is showing, many of us are very multi-talented and do way more than just beading!!! Travels with Beads - Results of our Survey. Whoa! Looks like LOTS of us travel with our beads, whether on full-blown vacations, summer at the cottage, or just around town to appointments – we’re a bunch of beading fools, taking our projects everywhere we go. So we asked you, "Do you travel with your beads? Do you have any tips for other beaders? What about requests?" Here are the results! Fishermen beware – the beaders’ are coming for your tackle boxes! The consensus is, tackle boxes, small tool boxes, and followed by soft-sided coolers are THE way to carry supplies. Make-up cases and pencil cases for small projects rule, as does the ever popular ziplock baggie! Baby wipe containers and pill bottles get a lot of use too. So does any number of small plastic compartmented boxes from the hardware store, so long as they have tight-fitting lids and dividers that go all the way to the top, so you can turn the box upside down and not have the beads mix! Adjustable dividers are favourite too, for those odd shaped things you need to carry. Lapdesks are popular, which is a board or tray with a sandbag back to contour to your knees. And some of you travel with your portable Ott lights too! Here’s some specific suggestions and general comments from our beaders. I use a small baby wipe container. I glued a magnet strip to the inside top to hold needles. I lined the bottom with vellum from an old blanket. I wrap my fireline around a piece of cardboard, tape it with the purple release tape used by painters. All beads I put in small plastic bags, and have a pair of tiny scissors (Cheap) that I got at Walmart that cut my fireline. I keep a project in there at all times. I put a rubber band around it, to insure it stays closed then if I have to go somewhere I toss it into my purse and go. I have made many projects waiting at doctors, dentists, etc. I take my beads with me when I go places. My kit comes in handy when the folks I stay with need a necklace fixed or re-strung. I take a portable lap desk. The bean-bag thingy on the bottom stabilizes the surface. I glue velux on the top with a fold over lip so nothing rolls off. Instant bead table. I even bead in the car! Yes, I have a small plastic box, with a velux pad that fits inside the top, so I always have kits or projects with me. If I am doing something with jumprings, I have a jump ring tool that will go on airplanes, or if it is a stringing project, I use fireline and pendant cutter, that also go through security at airports. I keep mine in a bag meant for toiletries that is the size of a book and folds out with lots of zippers to keep things in. I use a gardener's bag that has pockets on the outside. I can put my tools in the narrow pockets on the sides and my wire in the larger end pockets. I use a 9"x13" "brownie" pan lined with an old white flannel pillowcase to keep everything together while I am working on a project. I save the heavy and mesh zipper bags that come with things I purchase and use them to hold everything I need for a specific project. I like surgical clamps (has teeth, so you have to be careful of scratches) to secure ends. I use a lot of old pill bottles, both my parents keep their prescription bottles and the plastic is nice and clear and they come in all sizes to support different quantities. I simply put the necessities in a ziploc bag. The best portable projects are those that require few materials and lots of time, such as beadweaving projects. When I don't have a lot of time, I bring a beading magazine or book instead. Many small, resealable containers inside one larger one - the lid doubles as a work surface. When I go away each year for 2 months, I pack up key supplies and beads in a Rubbermaid bin and send it ahead via Canada Post!! I take my beading anywhere and everywhere. I'll even sit and do it while in the waiting room for an appointment. I have a small beading bag that houses a ton of stuff, and is easily portable. But generally, if I'm working on a project, I'll compact further, by putting everything I need for it in one container. It makes it easy when they call your name to stuff it back in the bag. I purchased an awesome make up kit from Wal-Mart for approx. $10. It has so much space. I removed the bottles, etc in the outer compartment and use the elastics to hold tools. I use those screw-together stackable plastic "towers" that hold approx. 4oz of beads per section. The best portable organizer that I have found is a soft sided fishing tackle box with 5 divided stacking trays. It has a place for EVERYTHING that I need to complete a project. Love those little "curiously strong" mint tins. I keep Baskin Robbins sample spoons in my boxes to scoop beads. I pull out the drawers of a plastic cart that contain the items I want to work with. So I don't have to fill nor empty any travelling box or bag and they easily stack up in the trunk of the car. I carry a small makeup bag with me and in it I have a set of tools and what ever project I might be working on at that time. I take my work with me were ever I go because I cannot stop my beading obsession so I just learn to live with it and enjoy it. I like to use pencil boxes to carry my projects. Usually everything I need will fit in a box, even if I'm working on chain maille at the time of my trip. For trips over a weekend long, my first choice would be to visit a local bead shop and get something to remember the trip. If no beadshops are around then I will draw, color or find a stone to remind me. I take the basic tools, crimps, wire, and various catches or toggles. I may bring the supplies for an on-going project...but if I come across a bead store while travelling (usually to Huntsville) I'm ready for anything!!! You know...Cub's Scout motto: "always be prepared"!! I take one divider case and the mini zip-lock bead bags, then I'm ready for anything that can get my imagination running!! And it doesn't take much!!! I pack project-sized items in a makeup bag. I also bring an Ott Lamp and a lapboard. I recently bought a stringing board that closes up and has padding on both sides so you can leave the partly-strung piece lying there when you have to stop beading. New foldable rubber bead board!! I pack everything in a tote bag and hope it does not fall out. A wheel-able tote (like what is out there for scrapbooking) for beaders would be great. I have a wheeled tool box, it carries a tonne of stuff and has oodles of compartments. I got it at Canadian Tire. It’s made by Black and Decker – it has a collapsible handle so it’s easy to move! Yup! I travel for my company, so my beads are always with me. I've tried lots of different containers, but always come back to the classic Ziplock bag. I'm a beadweaver for the most part, so it's fairly simple. I normally buy beads on vacation, then bring them back home to work on them. I do take my beads with me on vacation - they deserve it as much as I do. I use makeup bags for my different projects. I also like to seek out local bead stores to ooh and aah over their lampwork. I carry it all in my anti-tarnish boxes!! They are perfect for travel and working on the go. I always take my beading with me on vacation to the cottage. I just pack things up in a sports bag and off I go. The problem is that bag get heavier every year!!! I bought, at a second hand store, a carry bag that is like a brief case, but the material is soft and there is a huge pocket on each side that zips up, so its perfect. Lucky find!!!! Individual plastic bags, and store them in an old cookie tin. My work-in-progress supplies go into little pill keepers from the dollar store. I have a bag that holds a beading tray flat, and several plastic boxes for holding more beads, and they all fit into a Rubbermaid box. And the box fits behind the passenger seat on the floor. I use a system called Lock ups. They come in a variety of sizes. They stack easily up to four high. As each container has a separate lid that twists into the top of the next container so no spills. Of course my projects come w me where ever I roam - in my faux snake skin green make-up bag from Avon.. I use the Mastercraft 24/36/48/64 drawers, that are made to put screws and nails etc.in, to keep my beads sorted and portable. I do carry my bead projects with me. I'd die without them. Even to the doctor’s office, where I have my supplies in small 'wipes' containers. I bead on my lunch breaks at work. I like to keep duplicates of tools, so some live in the travel kit, but that gets expensive, so I put a list of tools on the top of the tool box that I have to add, i.e. magnifiers. That way, I can check the list, grab the extras, and not get to where I’m going and discover I’m missing something crucial! I go to lots of classes and take my tools – I marked them all on the handles with nail polish so that I can get mine back easily! We have a bus and I usually take along this huge tool box; At home, my husband bought me one of those 6 ft tool boxes to hold all my supplies, it works great! If I am just going outside to bead, I use an egg carton, works perfectly and closes up when I need to jump up (bees, mosquitos, etc lol). I assemble all components for small projects in flattish food saver containers. They pack easily, all the stuff is in one place, and it's even reasonably tidy. I carry a lunch box with a project I am working on at the time and take it EVERYWHERE! I roll up the project in a piece of felt and it sticks to it. Rectangular tubes with flip-top stoppers, which all fit into great little clear boxes, so you can see all the different beads you've selected for the project. I can often also fit my tiny scissors and nymo or fireline in as well. Just to be sure, I put a couple of elastics around the whole assembly. I usually use little plastic trays/boxes (1.5" x 4") that my friend's father gets when he stays at hotels (he's a flight attendant) for pouring out a few beads to work with. These boxes have 3 sections in the bottom and a lid, so you can have 3-4 different types out at the same time without them rolling around, or mixing together. I wish there was a fold up work table that folded up to like the size of a briefcase and folded out to about the size of a tv tray that had legs that locked in place and raised edges to keep beads from rolling. How about a “telescoping” or folding bead box -- kind of like one of those big, honking metal tool boxes you can get, only not quite so heavy and not quite so tacky. Something in wood - not plastic (ewww, plastic...). With a nice metal and mother-of-pearl inlay. Okay, so a person can dream, can't they?! I really need an extra arm coming from the center of my chest to keep everything level while riding in car, train, plane etc. Sorry - can't help you there - genetic re-engineering is really beyond our scope. ;-) However, we are on the lookout for the rollable rubber bead mats! Hope you find some useful tips in here, and will be ready to "roll" with your beads soon! If you love gems, if you think there is magic in the sparkle and glitter of big, coloured, faceted stones, if you can name at least three famous gemstones, if you consider seeing the Hope Diamond a pilgrimage, you should absolutely check out this blog: Gemwise. Authoritatively written by a U.S. goldsmith and insider in the world of fabulous gems, you will get to see and read about a world of high-end gems that you would never experience otherwise. Absolutely fascinating! Coming up next week - new ColourFX mixes, our custom seedbead mixes, and a new feature - Stone of the Month! A fabulous new stone bead in a variety of sizes and shapes. Each month, a new stone. I know it sounds like a long way away, but we're excited to be doing some preliminary planning today for the Creativ Festival this fall (October 17,18,19). While we do not normally attend this show, we have sporadically in the past. This year will be a little different. Swarovski is doing a large pavilion, with a ton of demo's and Make It and Take It classes. Our booth will be in the Swarovski Pavilion. Nadine, Cynthia, Erin and I will be doing a ton of demo's and Make and Take projects. These will run throughout the show. Some demo's will be at our booth, others will take place in Swarovski's classroom booth. We'll have lots of new Swarovski kits available for the projects we're demonstrating. Debby asked us: are the posts on any of your earring studs 11 mm long? I need some that are 11 mm! Most of the studs we carry have posts that are approximately 10mm long. However, there are a few with 11mm long posts which have small divots for the butterfly backings approximately 1-2mm in from the end of the post. Have you always been amazed by wire wrapped beads and cabochons? Are you looking to do more than just wrapped and simple loops? Then this class is for you! Coming in August we will have a new teacher at BeadFX, Robert Burton! Robert, a wire sculptor, has a natural flare for creating beautiful pieces of wearable art. His 30 years of experience in the bending and shaping of metals has made the transition to wire sculpting a natural one. 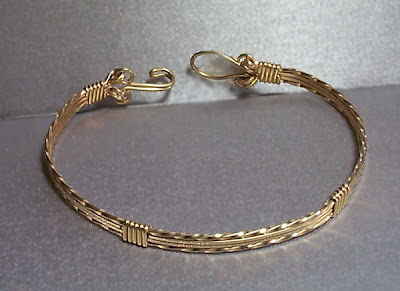 Robert will be teaching a 9-hour wire wrapping course spread over three Fridays. In this course you will learn basic wire techniques, wire wrapping and wire sculpting. You will also discuss the properties of various types of wire and learn the appropriate wire for use with different projects. Time permitting, you will create a ring, two pendants, a bracelet and earrings. It's easy to design for yourself, or to design in your own style. What happens when you have a special request for a style you don't normally create? Or a customer who has very specific colour requests. It can be very difficult to get inspired when working on a project that just isn't you. Today's post is not entirely altruistic on my part. It's my turn this week to create our weekly inspiration, and I have still not been able to get out of my creative slump. Now that I've posted this, I've just set myself up to be forced to create something truly awesome... yikes! Here are are some tips that should help get you moving in a new direction. If I want to evoke a calming, serene feel I look to pictures of the sea. For happy, brilliant colour - garden pictures! For colour inspiration, I also love looking through the treasuries on on Etsy. The treasuries are currated by members who generally have a really good eye for colour. If you are interested in learning about colour theory, I just found this short little tutorial. Try something new! If you're like me - a complete book junkie, go through your library of beading and jewellery books and magazines. Challenge yourself to actually try one of the projects that you've passed over previously, maybe thinking that it wasn't for you, or might be a challenge based on your current abilities. There are also a ton of resources available online for either a low fee, or free. Here are some sites below that offer tutorials online. Hopefully, these will help you - and me!